5 Bonus: what's it look like? The Galaxy S7 is coming. It will be the most-anticipated Android smartphone of 2016 [relative the general populace], because it will likely be the best selling single model of Android smartphone of 2016. It will almost certainly be announced next month in the lead-up to MWC. As such, the number of rumors and general crap flying around about the Galaxy S7 right now is slowly going critical, and you're probably seeing a lot of it mucking up your readers and social feeds. The question is: what do you believe? At this point, the summary is: not much. There are a few key tidbits out there I think really worth paying attention to, but there's also a lot of speculation and general rumor-mongering going on that makes it difficult to separate plausible, reliable information from something that would be better off on a fan forum with other fiction. This is a big reason we've been so wary of publishing anything about the S7. Samsung rumors fly like caps at a graduation ceremony: everybody wants a piece of the action, and everyone wants an angle. We'd like to give you a slightly more skeptical overview of the situation on the ground right now. This one comes to us from none other than @evleaks, whose track record isn't perfect, but Evan Blass has made a legend of himself in the mobile news business for delivering solid information on many occasions. In typical evleaks fashion, the tweet is devoid of much in the way of context and is a simple image of some text. While I wouldn't be overly suspicious of the veracity of this particular rumor - that the S7 will come in three flavors - I would be throwing salt over my shoulder to excess as to how exactly this will play out. It is entirely unclear what the context of this image is, where it came from, or when it was produced. In addition, even if this does pan out, we have no way of knowing if Samsung plans on releasing three variants of the S7 in every market it will sell the device. Perhaps the S7 edge+ would be reserved for some markets, perhaps not. Perhaps the S7 edge+ doesn't exist at all! The reason I have suspicion around this is that barely a week prior to that, Evan himself published an article on Venture Beat claiming there would be just two variants, and that the S7 edge would be larger than the standard 5.1" S7, at 5.5". There was no mention of an "S7 edge+." And three weeks ago Sammobile claimed to show a screenshot from an S7 edge variant with a 5.7" display, but later reneged on this when that Venture Beat piece was published claiming the sizes would be 5.1 and 5.5" only. We've also seen evidence of a 5.1" version of the S7 edge, though it's not a great source. This makes everything very, very confusing. Given what we know, I would even consider at least as a possibility that the S7 edge / edge+ distinction won't come to fruition at all, and that it was merely an idea on the drawing board at some point. We do not know anything for certain here, as no concrete evidence (e.g., promotional renders or physical devices) around which sizes and form factors will be released has yet emerged. There is simply too much conflicting or missing information here to draw a conclusion from, and for now, it's best to just wait until we know more. Sure, I can see that happening. The Snapdragon 820 processor has been found in [notoriously unreliable and easily spoofed] benchmark results for alleged S7s multiple times now, and the Snapdragon 820 has long been pegged for a worldwide retail debut in the S7, since at least late last year. Here's the thing, I don't place utmost confidence in the source. South Korea's notoriously sometimes-reliable-sometimes-not ET News has said that only China and the US will get the Snapdragon 820 - everyone else is getting an Exynos chip. Speculation, and I stress it is speculation, has the latter as potentially being the Exynos 8890. The Exynos 8890 was announced last November, theoretically meaning it should be a realistic choice for a part in the upcoming S7. The 8890 has 50% more GPU cores than the outgoing 7420, while CPU performance should be up 30% with power consumption down 10% according to Samsung. Why would Samsung split up Exynos and Snapdragon based on region? Is it plausible? To answer the second question: yes. Samsung has done it before with previous Galaxy S and Note devices, so this is nothing new. As to the first issue, well, China and the US have among the highest LTE market penetration of any countries on earth, and probably the largest LTE networks by geographic coverage. Qualcomm is generally understood to make the best LTE modems with support for the most bands. This is one possible explanation. The other is that both China and the US are highly important markets for Samsung. The former is a region where Samsung is struggling to obtain market share up against domestic competitors who offer far better prices on similarly-powerful devices. Snapdragon 820 production will likely be highly constrained in the chip's first few months on the market, so it's possible Samsung hopes to be able to leverage it as a major feature advantage over Chinese competitors who either won't be able to source the part or will only be able to obtain it in much smaller quantities. In the US, Qualcomm modems work seamlessly with Verizon and Sprint's aging CDMA networks, meaning one less thing for Samsung to support themselves (the S7 and Note 5 / S6e+ had Samsung's in-house Shannon modems) and potentially better network performance overall. Again, this is speculation. But the point of this speculation is to say that, yes, it seems entirely possible that Samsung will release Snapdragon variants of the S7 in the US and China, but not the rest of the world. Given that Samsung is currently the sole producer of Snapdragon 820 chips on earth and that said chips are using a new 14nm fabrication process, it's also very possible Samsung simply wouldn't be able to build enough 820s for every market on earth and still launch the S7 on time. In summary? Don't be at all surprised if you see Exynos chips in most markets and Snapdragon 820s in a select few (or two). This rumor comes once again from evleaks. Starting to look like a Friday, March 11th Galaxy release in the U.S.
Want confirmation? You aren't getting any. Retail launch dates are notoriously finicky and can change in the hours leading up to a product's announcement. While we have no idea what Evan Blass's source here is, third-party retailers in one form or another are almost always the go-to source for release date and pricing info. And you know what? They are constantly wrong. Placeholder dates and prices get put in systems, marketing materials use tentative information, and plans simply don't always work out. Might the S7 launch on March 11th? Sounds good to me. About as good as any date in March you could pin on a dartboard, and perhaps slightly better. Will the 11th be for all variants, or just the standard S7? Maybe the S7 and edge, but not the edge+? How about which carriers? Are they all launching on March 11th? Who knows! The best thing to take away from this rumor is that it seems very likely the Galaxy S7 will launch at some point in March-ish. When will it be announced? 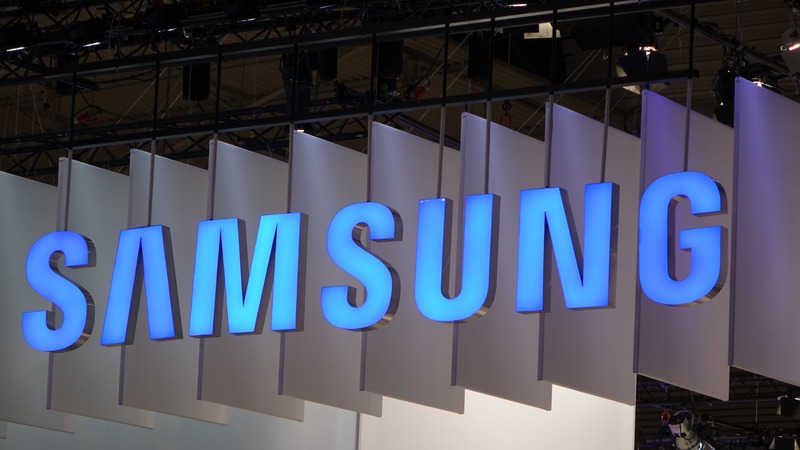 The S6 was announced at MWC last year, and rumors that Samsung has booked the same venue it used previously have been floating around casually. In addition, an alleged early Unpacked invitation was leaked with the publisher - a no-name on Twitter that really should not have your trust for any particular reason - claiming a date of February 21st. It's certainly possible. Dates are often the most difficult part of a phone's launch to pin down until the manufacturer actually makes them available, because rumors are often relying on information subject to change. Take dates as mere estimates until you see Samsung confirm them - there's really no reason to get your heart set on them, because they are very often subject to "adjustment." Specifications, which are the real meat and potatoes among us phone nerds, are surprisingly often leaked well in advance of most phones' launch dates. The issue is that about a half-dozen other incorrect or misleading specification rumors pop up in the meantime and just muddy everything up, making it impossible to determine what's reliable and what isn't. If I'm looking for a reliable source on hardware, I'm generally looking for a big name publication with a lot to lose by being wrong. The Wall Street Journal dished out a few key items for the Galaxy S7 back in December, and while I'm not saying they're infallible, that's where I'd be putting my money. Here's the short version of what they spilled. The Wall Street Journal also references a "retina scanner" but says it's uncertain whether it will make it into production. So unless you see it reliably confirmed elsewhere, I'd just ignore that for now. The pressure-sensitive display has been rumored by exactly zero other publications since then that I can find. But, when the Journal says it, they're probably pretty sure. The big asterisk on the feature, of course, is that it will likely use a Samsung-specific API that will render the functionality useless to other devices that are also released this year with 3D touch-like capabilities, and we likely won't see much movement on that front until Google publishes an API for Android itself. But Samsung may come up with some interesting implementations, who knows. The microSD card is corroborated by Evan Blass's report at Venture Beat, and the USB type C port was first rumored by Sammobile back in October. The USB-C port doesn't appear in a render by @OnLeaks, however, which is odd. Will Samsung vary the port used by market? That would be controversial, no doubt, but I wouldn't put it past them. It's also possible the USB type C port was axed late in development, though the Journal's report was published ten day after the OnLeaks render with the microUSB port went live. Unfortunately, the port issue remains a mystery for now. That same report also claims IP67 dust and water resistance and a 12MP f/1.7 rear camera. A camera of the same resolution has appeared in benchmarks and was also corroborated in an alleged "Samsung employee" leak. That same "employee" also backed up Blass's claims on the dust and water-resistance. Neither seems unlikely. Bonus: what's it look like? Well, we've got one source with a solid track record here, and it's Steve Hemmerstoffer, aka @OnLeaks. Here's the thing: it's just a render. And it doesn't have a USB-C port. But Hemmerstoffer has a surprising degree of access to manufacturer measurements and physical device information, and he does have a proper track record of being, well, right. He was basically dead on with the Huawei Mate 8 a full month and a half before it was unveiled. 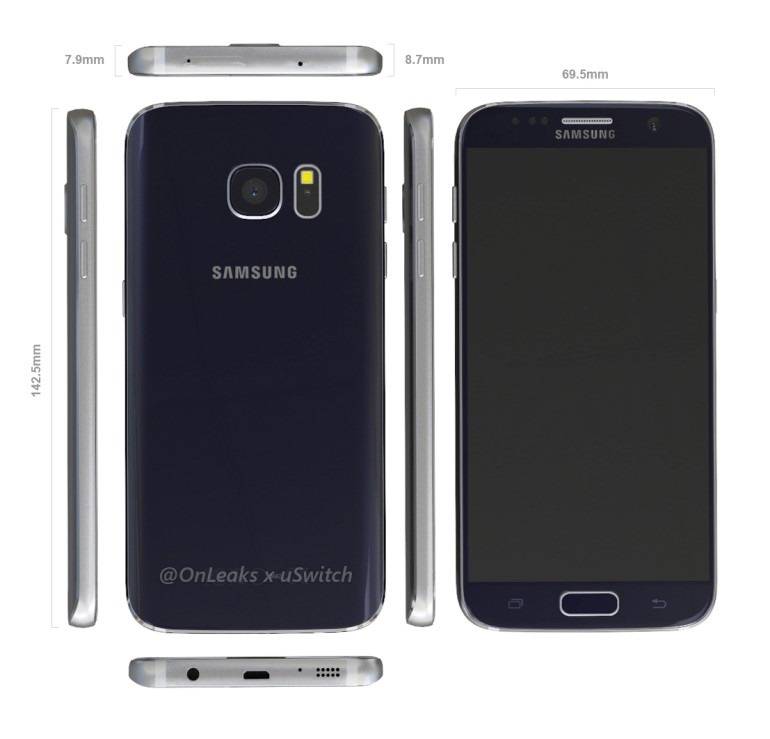 Here's his render - and let's be clear about what that means in just a second - of the Galaxy S7. His mockup would seem to indicate a SIM and SD combo tray, assuming he's got his information right, as well as a return of the standard capacitive buttons. The overall design is highly reminiscent of the Note 5, which makes sense. Hemmerstoffer has not published any images of the S7 edge variant. So, is it legit? I tend to trust OnLeak's renders myself, but it's possible certain details like the port or style of SD card slot may be off from the final device - we don't know. The render is from early December, so tweaks for production could have been made between then and now. But nothing about it looks especially suspicious, aside from the fact that you have to accept it's a facsimile that has been recreated, not a direct image taken from Samsung itself. That concludes our rather long look at the Galaxy S7 (and S7 edge) rumor-scape, and I'll be updating this post as more information hits the ground, as it is bound to, in the next month or so leading up to the phones' launch.